Have you noticed the half square triangle trend in quilting? Part of the popularity of the half square triangle block is versatility and the multiple design possibilities. Let’s take a look at just a few different ways you can design a quilt with this block, you’ll soon see that there are many “angles” all depending on which way you turn it. We’ll also give you links to tutorials, tips and tricks for sewing the perfect half square triangle block, so you’ll be ready to start your own quilt made with triangles! 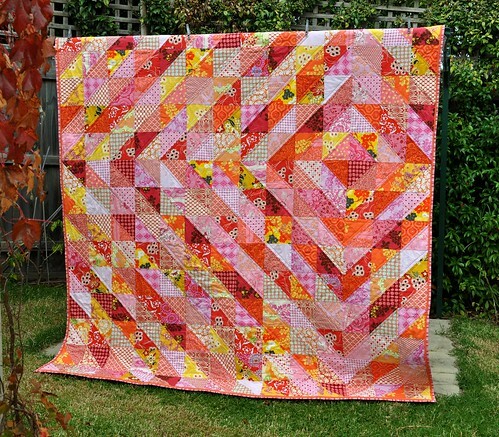 Angela from FussyCut made her bright and cheerful half square triangle quilt in an all-over design; the triangles are randomly arranged across the entire quilt. I love how Angela mixed all these bright colors together! Patch Andi arranged half square triangle blocks to make a beautiful diamond patterned quilt. Although there are lots of warm colors in this patchwork quilt, you can see how they are arranged to make alternating light and dark diamonds. Amy’s half squares are paired with white and then all lined up in the same direction, you can read more about her Half Square Spectrum Quilt at her blog, Diary of a Quilter. Are you starting to get the idea of how easy it is to change the pattern of a quilt just by changing the layout of the half square triangle blocks? Yep, it’s all in the way you arrange the blocks! Here’s another post from Amy at Diary of a Quilter where she shows you what happens when half square blocks made from a print and a solid are arranged in different ways – including a zigzag. Check out Amy’s post and get inspired to start playing with triangles! So, are you ready to start making blocks? Here’s a whole list of great tutorials, tips, and tricks for making half square triangles! Karen Johnson put together an excellent tutorial on making a basic half square triangle block, check out her Intro to Half Square Triangles at Connecting Threads. Camille Roskelly compiles some great tips and tricks for stitching up half square triangles, go and see A Few Little Half-square Triangle Tips at her blog, Simplify. Make 8 half square triangle blocks at a time with Lindsay’s Half Square Triangles tutorial from Sew, Mama, Sew! Previous Previous post: WeAllSew Goes Mobile! Next Next post: Congratulations, Krista!